After years hearing it I finally decided to complete a goal go jump in a lake. 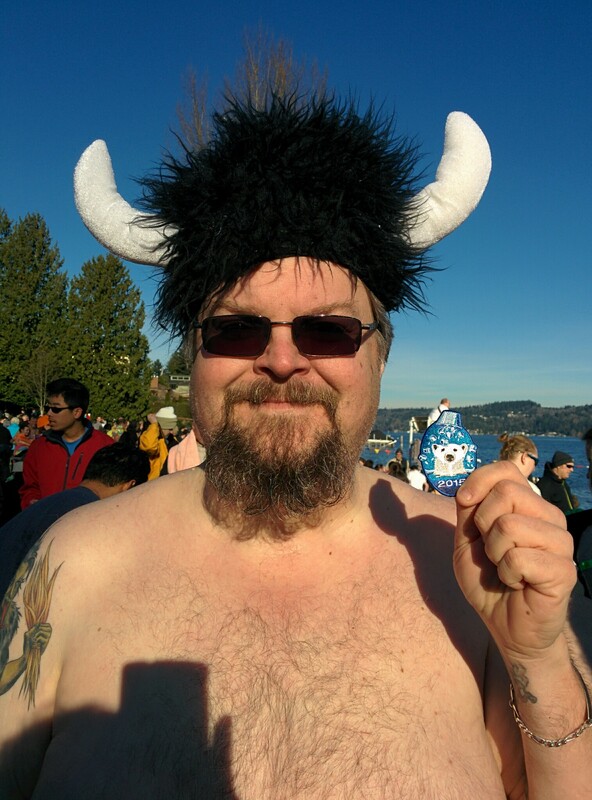 Not just any lake and not just any day, I joined over a thousand other people at Matthews Beach Park for the Seattle Polar Bear Plunge. So on January 1st my brother and I headed out early to get a parking space and meet our friends for the plunge. Luckily I was warned by a friend who had done the plunge before that the parking lot at the park fills up well before the plunge so we left two hours before the start to get a space and also check out the event before it became too crowded. As we pulled in to the parking lot we found that our plan had worked as there were a few spaces left. Our first stop was to “register” for the event. Registration usually means filling out papers and signing waivers. However, for this event all we had to do was go get a wristband showing that we were going to participate in the plunge and accepted the risks that might be involved. The next thing that caught my attention was a display that showed the air and water temperature. So we had a good hour to ponder jumping into 47F water. Well above freezing but well below what I consider comfortable. The sign showing the air and water temperature. True to Seattle, a lot of people dressed up. I saw more than one tiara, a couple of Waldos, a tentacled creature and more. I was kicking myself a bit for not bringing my outdoor camera. The wait passed quickly as we chatted with people nearby and helped take photos for groups. Before I knew it the announced warned us that the plunge for people needing extra time was about to begin, which meant we had only 15 minutes left to wait. Several people in the crowd told us that we should divest our extra layers at this time to not be stuck trying to pull off clothing while the hordes were pushing past us to jump in the lake. Also it was a good chance to acclimate to the colder temperature and not feel as much of a shock going from warm clothes to cold water. I had chosen to wear a pair of swim trunks and some crocs to protect my feet from rocks under the water. At first it was quite chilly to stand there in the 36F air with a light wind. However, as people moved closer to prepare for the plunge the mass of bodies around me blocked the wind and provided enough warmth I was actually comfortable. Suddenly everyone around was counting down. The shouts of “ten, nine, eight…” let me know we were about to go and I prepared for the shock of the water. I say we jumped in a lake but it wasn’t like that. Really once we reached zero everyone ran forward on the beach down into the water. To get credit for the plunge and earn the badge I had to go to a depth up to my neck. I didn’t relish the idea of getting my glasses wet so I was going to walk out until it was up to my neck and walk back. As I moved forward with everyone around me didn’t have time to worry about the temperature. That is until I reached a depth that put my tender bits in the water. My giblets! I reached the depth I wanted, turned around and headed back to shore. There on the beach my towel and dry clothes waited for me. I quickly dried off with a towel and headed to the registration tent to pick up my badge. Then we headed back to our gear and I removed my wet trunks and replaced them with a couple layers of dry clothing. Me after my plunge with my badge. I think that I worked myself up for a much colder experience than I had. Was it cold? Yes! Was it painful or uncomfortable? No, not really. I found it refreshing actually. 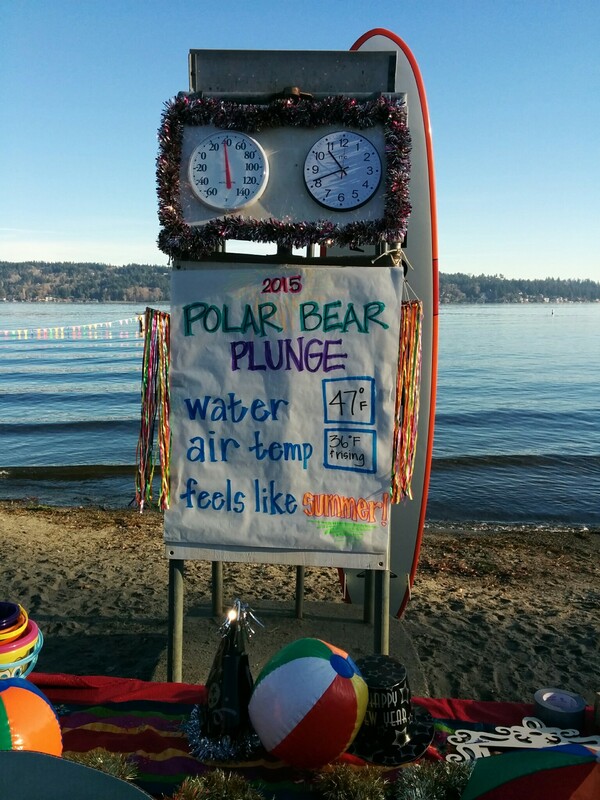 Then again, I didn’t stay for a long swim and Seattle has mild winters so the water was warmer than those at plunges where they have to carve a hole in the ice. 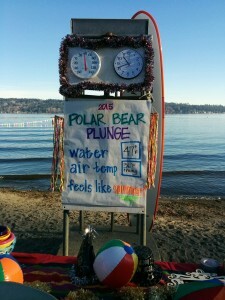 So I’m sure it could have been much colder and I’ll have to find one of those for a future plunge.